Anti-Vax Parents Spawn Chicken Pox Outbreak In NC - Joe.My.God. 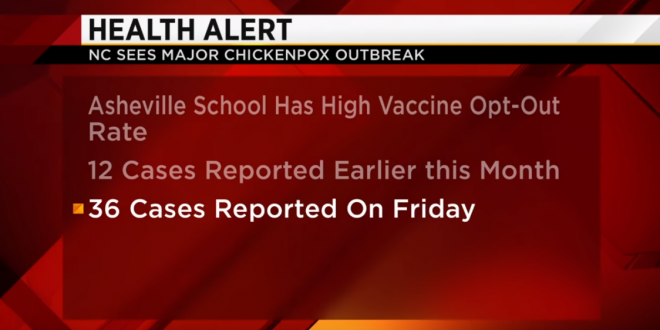 A chickenpox outbreak at a private school now ranks as North Carolina’s largest since a vaccine for the virus became available more than 20 years ago, health officials say. As of Friday, 36 students at Asheville Waldorf School had contracted the varicella virus, known to most as chickenpox. The school has one of the highest vaccination religious exemption rates in the state. Health care providers for years have recommended all children medically able, namely those who have healthy immune systems, be vaccinated, Mullendore said. Those recommendations have by and large have gone unheeded by the parents of Asheville Waldorf’s 152 students — 110 of whom have not received the chickenpox vaccine, which was made available in the United States in 1995. Like the Disneyland measles outbreak in 2015, the flare-up demonstrates the real-life consequences of a shadowy debate fueled by junk science and fomented by the same sort of Twitter bots and trolls that spread misinformation during the 2016 presidential election.